In the good old days, there was no way a bass player would show up for a gig with only a 2 x 10-inch speaker cabinet. Everybody had 1 x 15’s, 2 x 15’s, and 4 x 10’s, and they all weighed a ton. But these days I plenty of guys doing small gigs with a 1 x 12 or 2 x 10 or 2 x 12 cabinet. And they usually sound really good! We are looking at just such an animal today, the TC Electronic RS212. 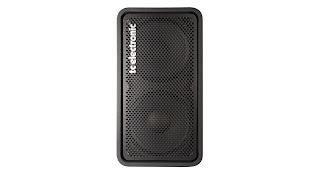 I recently had the change to try out a pair of these (singly and together) with the very nice TC Electronic RH750 bass amplifier. 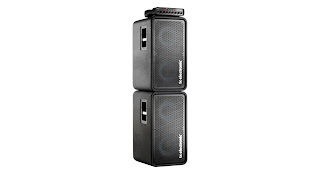 The RS212 are compact cabinets, measuring 14 by 26 by 19 inches and weighing in at a spritely 52 pounds. This might seem a bit heavy for what it is, but these speakers come by it honestly through liberal use of high-density 18mm birch plywood. They are designed so that they can be stacked any which way, a philosophy that TC Electronic believes in. They like the idea of stacking the cabinets on end so they are tall and the performers can hear them better. Seems reasonable to me. They are covered in a non-skid coating (sprayed on, maybe? ), and I am glad to see that fuzzy carpet speaker coverings are no longer in vogue. The carpet looks just terrible after a few years, no matter how well you take care of it. The carry handles and front grill are made of steel and are recessed into the chassis so they should not suffer too much in transit. 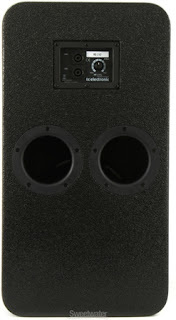 Each cabinet is loaded with two 12-inch custom Eminence speakers coupled with a Eminence 33mm titanium co-axial tweeter. The RS212 is rated at 400 watts at 8 ohms. There are two parallel ¼-inch/Speakon connectors on the back panel, along with a tweeter control knob (turning it all the way counterclockwise turns it OFF). I hooked these cabinets up to the RH750, and went to town with a few different active and passive basses. They performed nicely with all of them. TC Electronic did a great job of matching these cabinets up with their amplifiers. With my passive Precision Bass with Deep Talkin’ Labella flats these, speakers are really smooth and well-balanced. I found that the low-end was a little thin when using one cabinet, but when I hooked both of them up thy really came to life. When moving to the upper volume extremes these cabinets can really move some air, and they are well-ported in the back to help out with this. With some active basses, a Sadowsky P and a Marcus Miller Jazz, these cabinets can achieve a very sharp and high-fi sound. They could get a hard punching sound that made me smile like a little kid. I fiddled with the tweeter a bit and ended up backing it off about half way to get the tone that I liked. When hooked together, the RS 212 cabinets could take everything that the 750 watt class D RH750 head could put out, and the amount of volume would be sufficient for most normal club or party gigs. I liked having the two cabs stacked on end and not only could I hear myself better, it seems like the overall bass tone was more focused. And I think that a single cab would be fine for smaller gigs, and it is certainly nice to practice with. 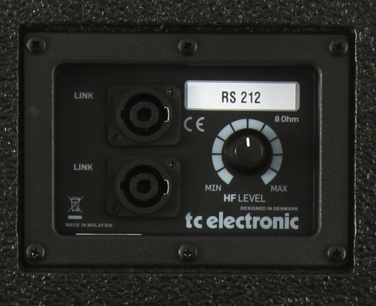 Overall, I really like the TC Electronic RS212 cabinets, and if I was looking for a new set-up, I would be actively looking to pick up a pair of these and an RH750. This company has a good handle on what gigging bassists need, and they are filling this niche nicely. 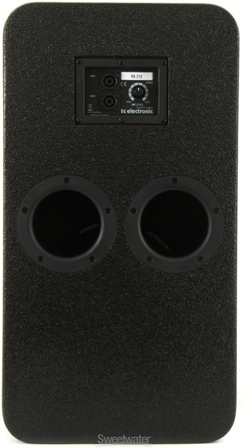 The RS 212 cabinets have a list price of $909 and a street price of $599. Check them out if you get a chance! Great review and thank you!